Vote forTamworth, NSWTop Regional Destinations Which are Australia's must-visit destinations? You help us decide. Most famously known as the Country Music Capital of Australia, Tamworth in NSW is a vibrant Regional City that plays host to a jam packed roster of events all year ‘round. In many ways, Tamworth embodies the 'perfect country town'; celebrating all things country music, Tamworth offers visitors the chance to enjoy the Australian countryside with all the convenience of a regional city built in. Known as the country music capital, every year Tamworth transforms into a country music mecca with local, national and international acts travelling to the inland town to take to the stage and perform for tens of thousands of visitors from around the country. The Tamworth Country Music Festival has been operating in the area and drawing large crowds for almost 50 years, putting it on the map for international country music fans. The epitome of an Aussie country town, there is so much to see and do in Tamworth. Foodies will be well in their element as the region produces a range of fresh produce, meat and poultry making for a fresh, delicious and local dining experience. The region is also home to a number of great natural attractions including the Horton Falls walks, Thunderbolts Rock, Nowendoc National Park and Split Rock Dam. With a bustling cultural, scenic and culinary scene, Tamworth acts as an ideal inland getaway for those looking to see the real Australia away from the hustle and bustle of the capital cities. The Country Music Trail is also a popular way to see and learn about the region's rich musical background. The trail walks you through the inception of country music in Australia to the most recent feats. The trail takes you past various sights including the Slim Dusty bronze statue, Golden Guitar winner plaques, the Galaxy of Stars and country music 'Hands of Fame' park. Even if you aren't an avid country music fan the history of this town is something to admire. Events aside, Tamworth is fast becoming known as the playground capital of NSW, attracting families from right across Australia. The award-winning Tamworth Regional Playground plays host to thousands of visitors each week, with it’s trademark Sky Walk, the largest in the Southern Hemisphere, and a café/restaurant facility right in the heart of the playground – there’s something for kids as well as parents. You’ll also find the unique Tamworth Marsupial Park nestled amongst the hills, where children (and adults alike) can get up close and personal with our native wildlife, and burn off some energy on the newly built Tamworth Adventure Playground. Looking to pay a visit to Tamworth but not sure what to do? Here are some of the most essential experiences. What's new in Tamworth in 2017/2018? The Tamworth Country Music Festival is the Southern Hemisphere's largest festival; a 10-day event that features 700 artists across more than 2,800 events. In April, history buffs can enjoy the Tamworth Regional Heritage Festival which a celebration of the Region’s rich history. 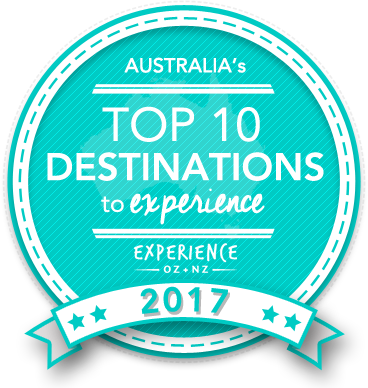 Is Tamworth Australia's Top Regional Destination to Experience for 2017? Vote now for the chance to WIN an epic trip to one of Australia's top destinations!